Published: May 16, 2012 at 12:36 p.m. When the New York Giants are presented with their Super Bowl XLVI championship rings on Wednesday night, defensive end Justin Tuck harbors some serious expectations. 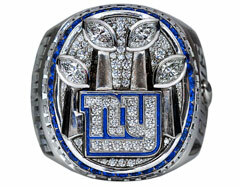 "(Former Giants defensive lineman Michael Strahan) talked about the '10-table ring,' " Tuck told the New York Daily News. "He wanted a ring you could see from 10 tables away. "I talked about the 'Restaurant Ring.' I wanted one that was big enough to see throughout whatever restaurant you go in and see it from each corner." Not the problems faced by you and me, but when an NFL player wins the Super Bowl, he takes on a sudden, special interest in jewelry. The team will receive their rings at a private ceremony at Tiffany & Co. in New York. We learned Wednesday the final design is close to photos released over Twitter by punter Steve Weatherford on Tuesday. â¢ Unlike past rings, the Giants pushed for a heavy dose of blue: "The blue makes it a little different," quarterback Eli Manning told the newspaper. "We wanted some blue. The Giants are Big Blue. We definitely wanted to get a little blue to spark it up a little bit." â¢ Thirty-seven blue sapphires circle the face of the ring and coach Tom Coughlin insisted the words "World Champions" appear on the surface, according to Tuck. â¢ Special to last year's roster, the words "Finish" and "All In" are engraved on the inside. â¢ Finally, designers have not forgotten about the history of this franchise: Four Lombardi trophies decorate the surface. "When Tiffany brought (the design) in the last day, there was silence because everyone was thinking, 'Wow,' " Tuck said in a statement released by the Giants. "It really captured everything we wanted to capture in the ring." Mission accomplished. Congratulations to the Giants and their fans.